We’ve all forgotten something. Whether it’s a person’s name or that meeting at noon, every single one of us has spaced some kind of information at one point or another. For many of us, getting locked out because we’ve forgotten our keys is a regular occurence. This means large sums of money are invested in spare or duplicate keys and getting on a first name basis with your local locksmith. If you’re tired of losing your keys, then the professional locksmiths at CRS Locksmith have the perfect blog for you. 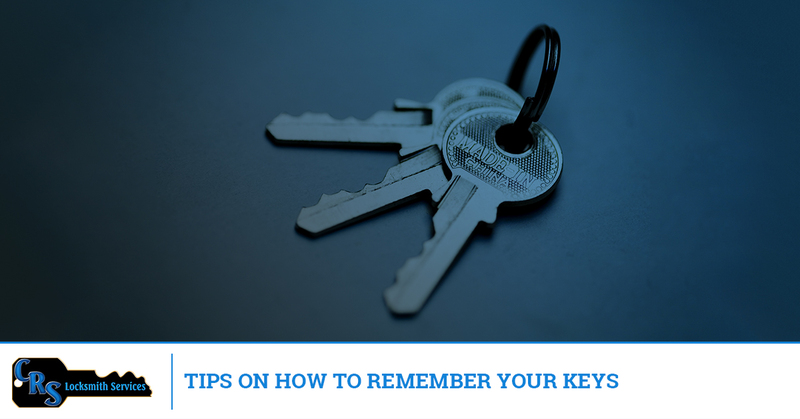 Below we’ll go over a few methods that are sure to help you remember your keys before you leave. Use one, a combination of a few, or all of the ideas to help you remember your keys every time. Keychains are awesome. Not only do they add individuality to an otherwise mundane device, they can also help you remember your keys. Add personal items to your keys like a cool collectible of your favorite movie/TV character, a miniaturized version of your favorite picture, or even a simple nylon rope. By putting something you care about on your keychain, you’ll always want to be sure you have them with you no matter where you go. Adding items you care about to your keys will build a psychological wanting for them, helping you naturally remember your keys before you lock yourself out. Modern times calls for modern measures. The growing number of people losing or misplacing their keys has actually given birth to a technological key finding industry. Find a brand or type you really like and add the object to your keychain. You’ll be able to choose from models with many different locating devices or a single one to keep tabs on your own keys. Most use the help of an app you can download onto your phone or tablet, but some come with a physical locater you can carry with you. Find your keys anywhere with a personal key finder! Ever find your keys in the fridge or under your pillow? Though you don’t mean to store your keys in places like these, sometimes they end up accidentally being stashed in non-obvious places. A solution to this? Put your keys in a place that stands out. Put them on the kitchen counter with nothing else around them, place them on top of objects you know you’ll remember to bring, or buy/make a key holder and put it next to your door. If you have great attention to detail and still can’t remember your keys, then placing them in areas where they stand out will surely help you keep track of them. We hope you’ve found this blog to be helpful. If you need a residential locksmith in Folsom, El Dorado Hills, or any of the surrounding areas, then the expert locksmiths at CRS Locksmith are ready to help you. Learn about the locksmith services we can provide for you, view testimonials from highly satisfied customers, or contact CRS Locksmith to learn more and get a free estimate.